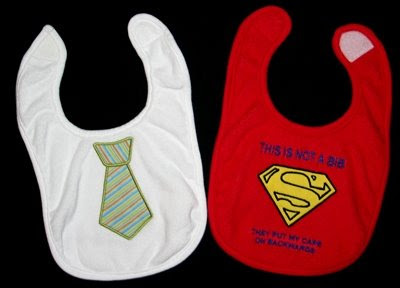 Last year Tiffany requested a sports themed gift for baby Will. Now thirteen months later (WOW!) his new baby sister needs a gift! 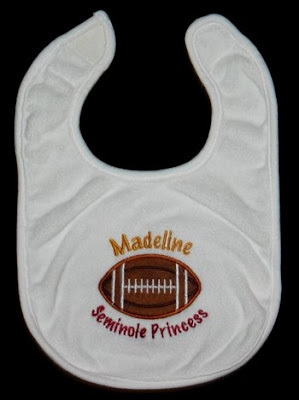 Madeline will be receiving a bib that coordinates with one of her brother's. The applique is from a football sucker holder design from Embroidery Garden (a freebie on her yahoo group) and I added the text with Embird Alphabet #8. 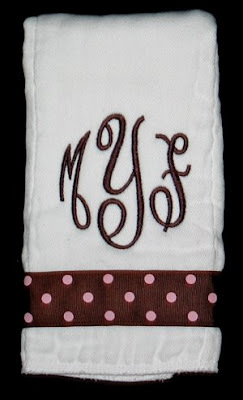 This burp cloth features her lovely monogram using the Empire font from Embroidery Arts. My 35th Special Delivery design! 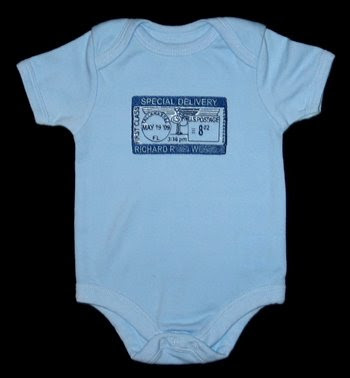 A couple weeks ago I stitched another Special Delivery onesie for a family that had received a gift certificate. 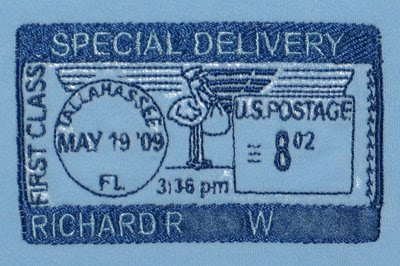 This is the thirty-fifth Special Delivery design that I have stitched! 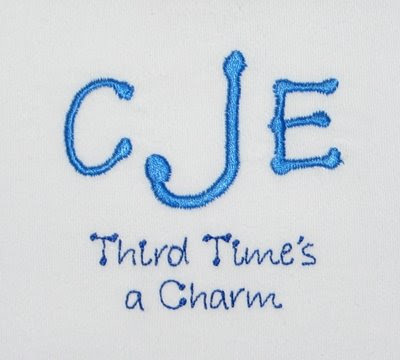 The applique D is from Embroidery Boutique's Fun Applique Alphabet. 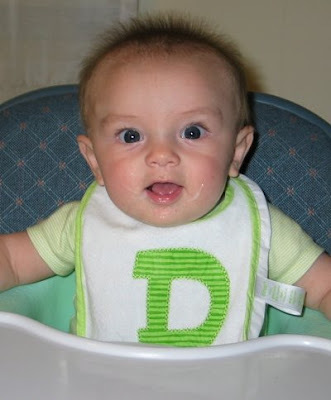 Dashiell has been eating rice cereal for about 3 weeks now, and we are in need of bibs! I have a stack sitting by my machine with designs picked out, so hopefully over the next week or so I can get to them. 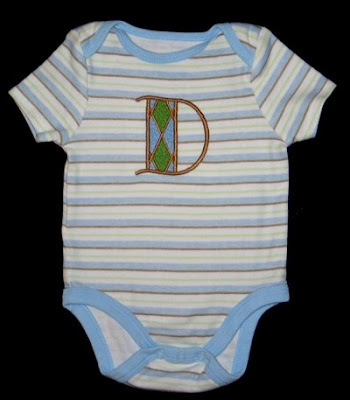 For this onesie I used Lynnie Pinnie's Preppy Plaid Font. And here's Dashiell modeling it. 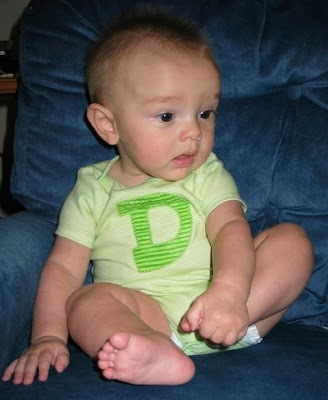 Notice how he's sitting up without any support -- this is the new skill we've been practicing! "My Miss Susie Inspired Wardrobe"
This past year in preschool Annaliese's teacher Miss Susie taught units based on the season and the letter of the week. At the very beginning of the year she read "Brown Bear, Brown Bear What Do You See?" 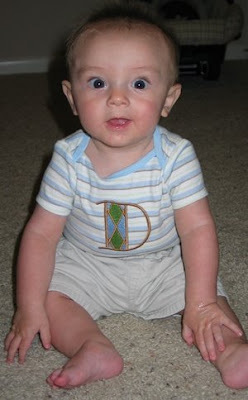 when they talked about the letter B. They studied apples while learning about the letter A. Annaliese already had shirts with a brown bear and an apple, so I encouraged her to wear them those weeks. A few weeks later when they were preparing to study Owls, Annaliese requested a shirt with an Owl on it. At that moment Grandma Kathy and I decided to make a shirt for each topic for the remainder of the year. There were times we were frustrated with ourselves for making this decision, but now that it's over, I'm glad we did it. It was a fun challenge to find the perfect designs and provided lots of inspiration for our stitching! By combining our efforts Annaliese had something to wear for 22 of the 26 letters. R, S, and M were themes covered before doing Owls, and X... well I just ran out of steam at the end of the year. As a thank you gift I made a scrapbook for Miss Susie. Before handing it over, Carlin scanned each page and has created a digital version of the scrapbook. I now present it to you to flip through! Scrapbook of "My Miss Susie Inspired Wardrobe"
I eventually plan to make a t-shirt quilt for Annaliese with all the stuff Kathy and I have stitched for her. But I'm not cutting these shirts up yet! Annaliese's buddy Kenzie will probably be in Miss Susie's class this coming fall. We plan to loan her the themed shirts so she too can have a "Miss Susie Inspired Wardrobe"! If you are interested in design details, I have linked to my original blog posts for the shirts I stitched. 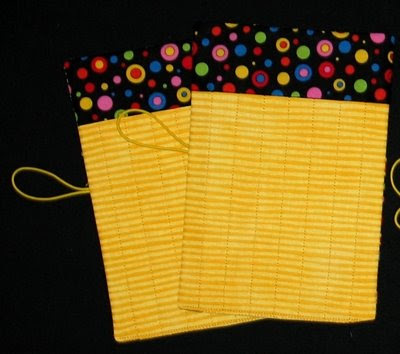 For those that Kathy stitched, I've included links to the designs she used. 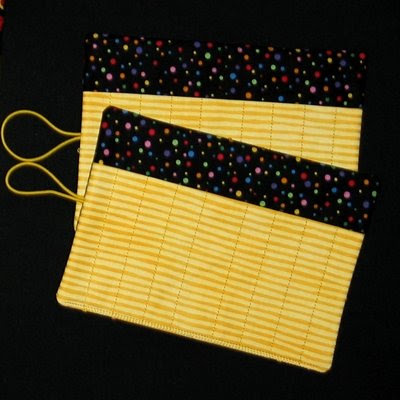 I thought with summer starting and not having to drive Annaliese back and forth to preschool every day I would have more time to sew. So far, not the case... maybe now that daily swim lessons are over I can continue to tackle my to do list. We'll see. 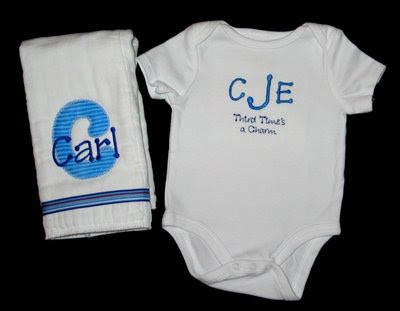 Baby Carl is going to be named after his grandfather and father, so he's a third! The monogram uses Tinker Toy Alphabet from 8 Claws and a Paw and for the text I used an alphabet I have from Oregon Patch Works. 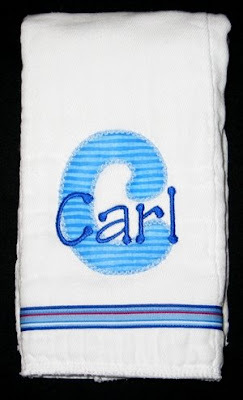 For the burp cloth the capital C monogram is from Vintage Applique Alphabet from Embroidery Boutique. I added "Carl" with the Tinker Toy alphabet from 8 Claws and a Paw. 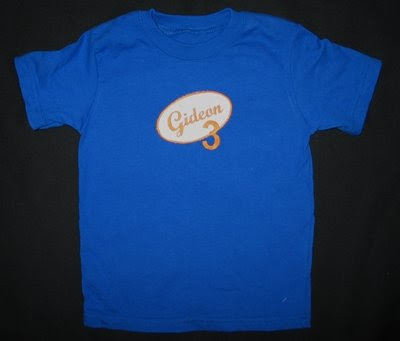 Gideon is turning three and LOVES the movie Cars. 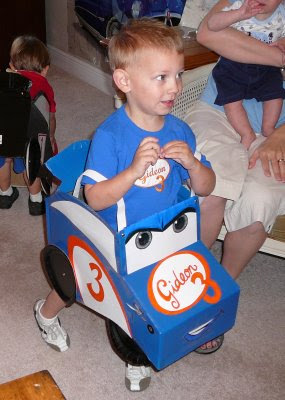 Because she's such a groovy mommy, Daisha threw him a Cars-themed birthday party, but the star of this event is Gideon, not McQueen! 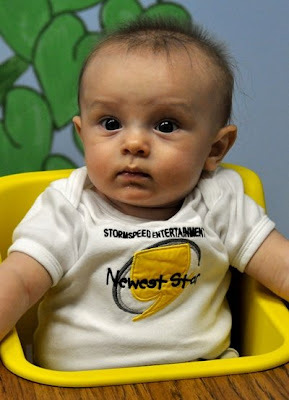 She created his own race car and logo, and asked me to make him a shirt for the occasion. Daisha gave me drawing of what she had in mind, and I was able to find an alphabet I already had that matched pretty well. 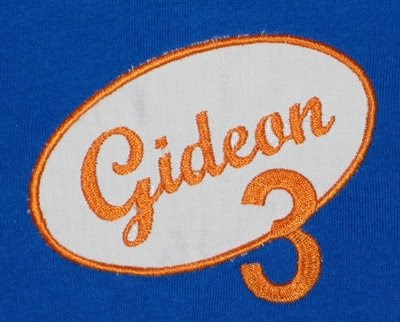 I put it in an oval, added the number "3" and stitched away! The font is Script 1 from 8 Paws and a Claw. I digitized the applique oval, and added the three with Embird Alphabet #2.